Nourish Scotland’s food justice programme is for people with experience of food injustice to make change happen in Scotland and help shape the Good Food Nation Bill. This year we have a big opportunity to campaign for a fairer, more sustainable food system in Scotland! The Scottish Government is expected to start consulting on the Good Food Nation Bill over the next few months. To make change happen, we need more and more diverse voices to be heard in this process, as food concerns all of us and the current system leaves many people behind. We all have the right to be able to eat well, regardless of our circumstances, and we have a right to a food system that takes good care of people and planet. 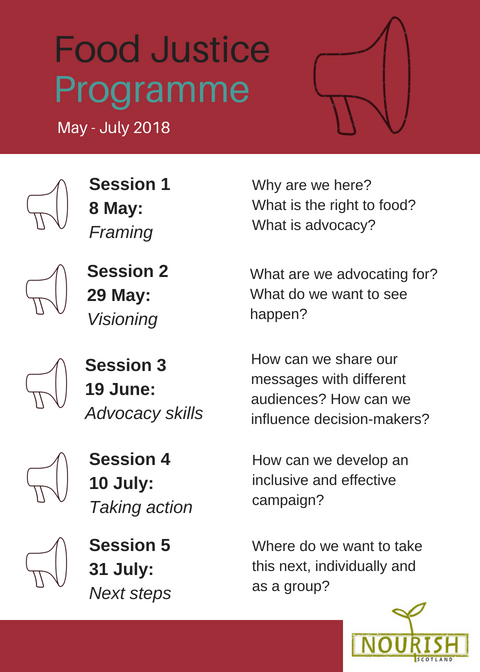 The food justice programme aims to support people who have experience of food injustice to advocate for change -whether you work in the food sector and struggle to make a living, have experience of food insecurity and/or have faced other barriers in terms of accessing the food you need. connect with others passionate about food justice, and with the wider food justice movement in Scotland. The workshops will be a chance for you to share experiences and concerns, learn and practice new skills and develop ideas for action. We’ll also be learning more about running effective campaigns from invited campaigners, decision-makers and journalists. We want to work closely together with the group to tailor the content of the sessions to what you want to learn and do. In between the sessions, we will encourage you to do various activities to put your learning into practice . We will also offer one-to-one support with any campaigns or activities you would like to develop during or after the programme in your own community, group(s) or network(s). Resource – What is advocacy? Homework Template – How will I engage my MSP? The Food Justice Programme is made possible with the generous support of the Joseph Rowntree Charitable Trust. If you have any questions about the programme don’t hesitate to get in touch on 0131 226 1497.